Zinc & Zinc Alloy Plating: This is a separate category simply because Zn is the worlds most desired sacrificial Coating, providing both Functional and Decorative finishes. Cadmium, Copper, Nickel, Chrome, Hard Chrome, & Brass. All these items are utilized throughout industries world wide for industrial, commercial and decorative applications. We design lines using the most updated equipment and engineering capabilities but always keeping within the limits of the customers needs & expectations. 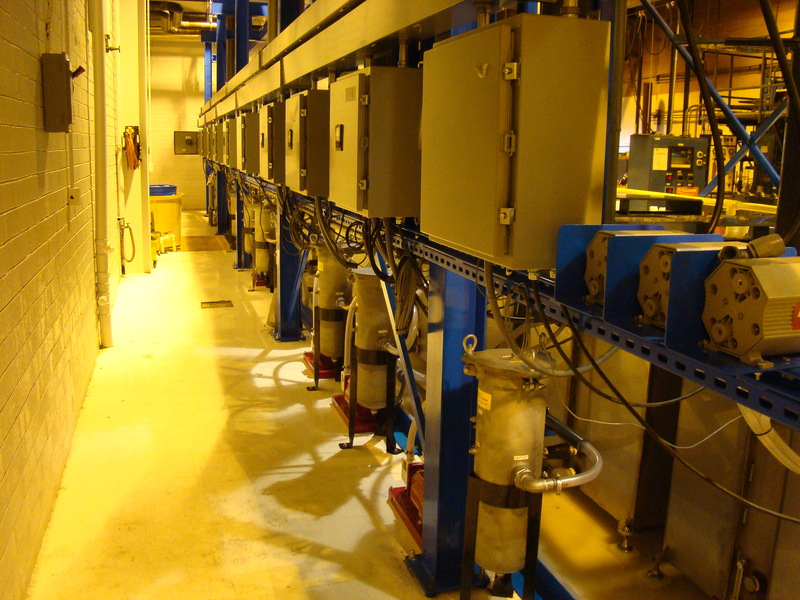 From fully automatic plating and Anodizing lines to manual lines. Regardless of the line size,the Mantra stays the same, High Quality Equipment, built on time producing consistent quality parts. HVOF: Thermal Spray Coatings. We have designed and built a complete HVOF Stripping System designed to efficiently strip parts that have had the High Velocity Coatings applied for re-work applications. This is a major advantage for any company involved in this industry from the Military to the Oil field. Ventilation Systems are a significant part of the Metal Finishing Plating Budget. Consideration of all the surrounding infrastructure both inside and outside the building, must be taken into account in its design. We design a truly state of the art system utilizing the best technology and Industrial Representatives to provide a complete overview of the necessary regulatory requirements both now and in the future. Whether the system is small or the size of a football field the expectations are the same, performance of the systems and mitigation of nearby air movement. Often time metal finishers realize that the best most productive work that comes out of their lines is never better then when the chemistry and the rinses are clean. The way to maximize production and minimize rejects is to filter the Plating baths and use the cleanest water possible for your rinses. By utilizing Counter Flow Rinse you can for example save about 95% of a gallon of water when you compare three (3) counter flow rinses to only one (1) rinse. An example is; If a plater requires the generally accepted dilution ratio of 5000:1, for example, he’d need 4,999 gallons to rinse away one gallon of drag-out, if only one rinse were available, but only 17 gallons if he had used a three tank counter-flow. Thus he would have saved 4,999-17 = 4,982 gallons. The percentage saved would be 4,982 ÷ 4,999 x 100 = 99.66%. At the end of many systems especially Anodizing and Electroless Nickel and other Electroless applications, a final Reverse Osmosis Rinse is preferred to eliminate any residual salts in the final rinse. American Chemical and Equipment has been a supplier of plating tanks and other services for metal finishing since the late 1980s. Visit our website and call at (708) 531-9199.